Norwegian sculptor Gustav Vigeland lived and worked in the Oslo museum bearing his name for nearly 20 years, and the entire building underwent extensive refurbishment this year. 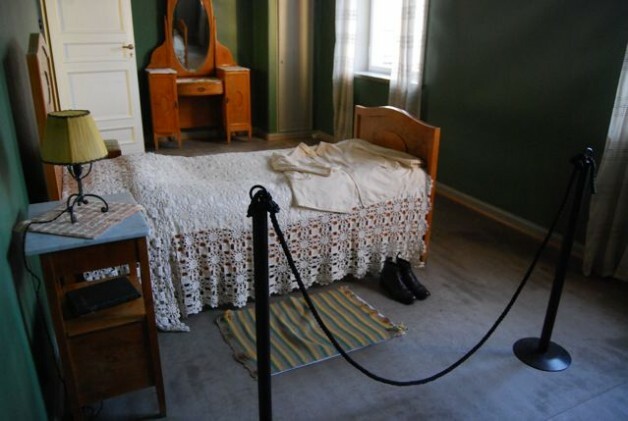 His apartment remains as he left it when he died in 1943, and the museum occasionally offers guided tours. Views and News seized a recent opportunity to have a look around. The City of Oslo built the museum initially as a studio and home for Vigeland, and backed his massive sculpture project inside the adjacent Frogner Park. When Vigeland died, the city inherited all the contents, right down to the personal items left on his large desk, including mail and his business cards. 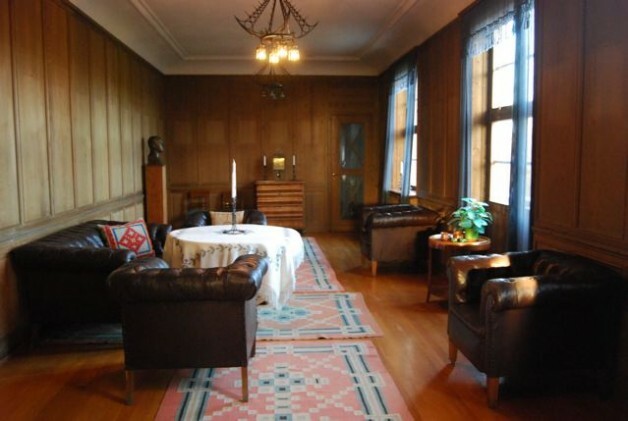 That made it a lot easier for historians and museum staff to exhibit his home as it was during Vigeland’s lifetime. 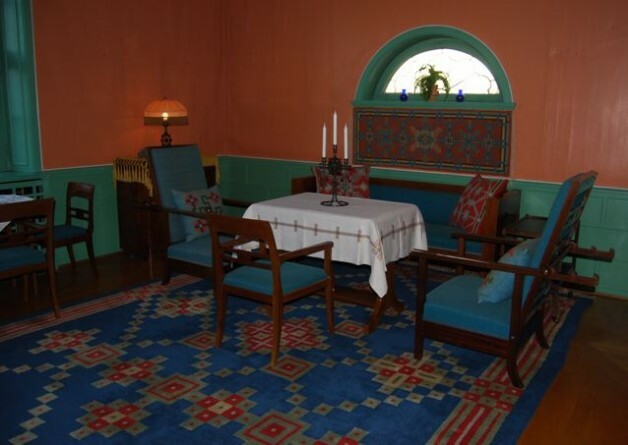 The photo above shows the apartment’s main living room, which contains furniture, carpets and decoration all created by Vigeland himself. The spacious apartment covers around 300 square meters on the upper floors of the museum, accessible via a stairway to the left of of the main lobby. The artist lived there from 1924 until 1943 and arguably still does in spirit, as his ashes, at his request, were placed in the tower at the center of the building. From there, Vigeland could watch his sculpture park take shape on the vast grounds of the old Frogner Farm. The photo above shows another sitting room in the apartment, which looks out over the large lawn in front of the building. Vigeland designed all the lamps and furniture here as well. Vigeland had his own bedroom with this simple, single bed in a relatively spartan room. Again, all the furnishings are original, and the smock and boots are his. 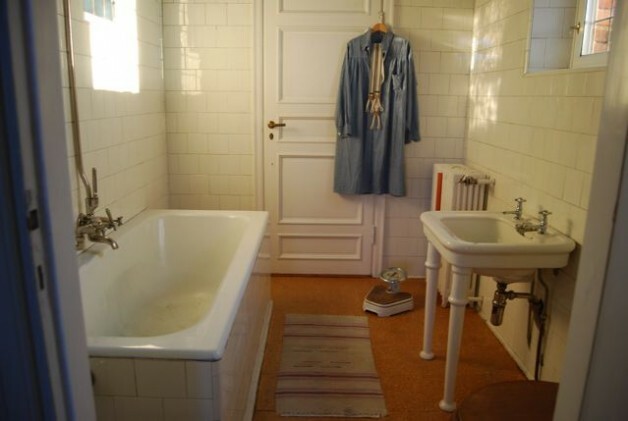 The bedroom had an adjoining bathroom, a luxury in the 1920s when many Oslo apartment buildings still had shared outdoor toilets in common backyards, and indoor plumbing was not widespread. The fixtures are classic for the 1920s and 1930s, as are the tiles. 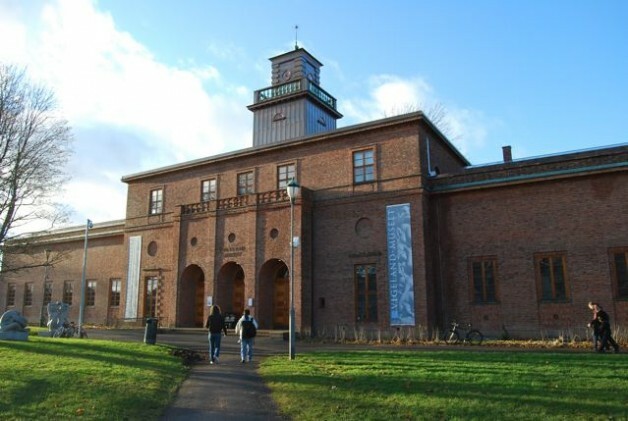 For more on the Vigeland Museum itself, click here.